From the head of the Washington Post’s investigative team, a vivid account of the anthrax scare of 2001 and the government’s bumbling response to this still unsolved crime. 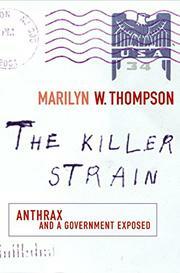 Thompson gives her story a human face by focusing on three principal characters: Leroy Richmond, a postal worker who contracted anthrax at the Brentwood mail processing center in Washington, D.C.; John Ezzell, an anthrax specialist at the US Army Medical Research Institute of Infectious Diseases (USAMRIID) at Fort Detrick, Maryland; and Dr. Jeffrey Koplan, director of the Centers for Disease Control and Prevention (CDC) in Atlanta. Anticipating that any bioterrorist attack would be on a grander scale, the US was unprepared for something as simple as anthrax spores tucked into an envelope and dropped into the mail. The author reveals that while Health and Human Services Secretary Tommy Thompson was issuing feel-good assurances to the public of smooth interagency cooperation, behind-the-scenes local, state, and federal authorities with competing jurisdictions and egos scrambled to establish who was in charge and how much the public should be told. The CDC’s epidemiological team ran into early conflicts with the FBI’s criminal investigators, and questions over closing down the Brentwood facility strained relations for a time between the CDC on one side and the US Postal Service and the White House on the other. Further, once the anthrax was found to be in an aerosol form requiring professional preparation, USAMRIID itself came under suspicion as a possible source of either the raw materials or the necessary technical expertise. The author’s vigorous text conveys a rousing drama of delayed responses, mistakes in judgment, and spin-doctoring as well as technical skill, personal bravery, and some good and bad luck. A can’t-put-it-down narrative: frightening, informative, and, with bioterrorism in the forefront of the news, timely.